En bärnstensfärgad pils med en tydlig malt arom och en kraftig men behaglig beska med viss krispighet och frukt toner, passar utmärkt till det mesta från husmanskost till kraftiga grill rätter. UPDATED: MAR 16, 2016 Backlog, early amateur rating! @ Havregatan 201209xx. Bottle from Systembolaget. Malty, grassy, caramely notes. 33 cl bottle ordered by the bottle to Systembolaget in Mölndal. BB 13..01.13, sampled on October 22, 2012. Hazy amber color, small white head. Herbal hoppy scent, some roasted and phenolic smoke notes as well. Thin, some roasted notes, mainly acidic dry to sour taste. Third drain pour bottle in a row from this brewery, I don’t think I’ll buy any more from them. Thin mouthfeel, medium low bitterness. Dry and sour finish. No thank you, get your act together, this isn’t working. Bottle (Stockholm Beer Festival 2012) - Golden in colour. Tea, lemon and malt in the aroma. Tea, hops, lemon and honey in the taste. Doftar malt. Smakar malt. Fyllig och välbalanserad. Dock är vörten/basen lite knepig i sig...och det verkar gälla samtliga Stockebodas öl (landsbygd, stall). 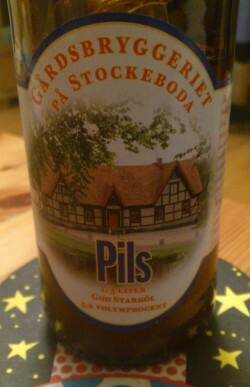 From a 33 cl bottle at home in Skövde. Golden a bit hazy beer with a lacy offwhite head. Malty, fudge aroma. Similar flavour, a bit thin. Bottle. Somewhat hazy pale golden beer with a small off-white head. Butter aroma, fruity, cookie-dough, hop notes. Fruity hoppy flavor, citrus, grass, diacetyl notes, apples. Hoppy fruity finish. Quite pleasant. tap at store øl, små bryggerier. hazy golden, small whiet head.. aroma is butter, malts. flavor is butter, caramel, hoppy balance.